If you know the website Worldstarhiphop then you've probably gone there to watch some of the craziest videos on the internet. Want to watch people fighting, having, or peeing in public? Worldstarhiphop is where you go. 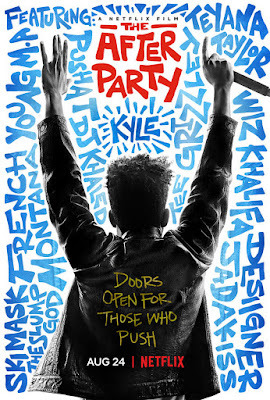 Well now they're getting into the movie business with the Netflix comedy, The After Party, which has just released its first trailer. Behind the camera is Ian Edelman, best known for the short-lived HBO series How to Make it in America, and it has a similar feel. Hip-hop artist KYLE stars as an aspiring rapper who, along with his best buddy, are trying to make it big in the rap game. But after a concert ends in projectile vomit and a seizure, all hope seems lost. That is until the after party leaves them with one more shot at getting a record deal, but first they must get through the night. Hip-hop superstars French Montana, DJ Khaled, Pusha T, Wiz Khalifa and more make appearances, and it's clear by the trailer they're counting on them to draw in audiences. Harrison Holzer, Shelley Hennig, Teyana Taylor, Jordan Rock, Amin Joseph, Andy Buckley and Blair Underwood round out the rest of the cast. The After Party hits Netflix on August 24th.